‘Tis the season of thoughtful gifts to encourage our loved ones to pursue their passions. It’s a heartwarming time of year. If you’re looking to support a professional woman – significant other, wife, daughter, sister, or mother who is looking to expand her career with networking, lunch n learns, meetups, conferences, or public speaking – may I suggest some gifts to consider? As a collection, these gifts provide an incredible go-to kit for both internal and external company events that help handle the stress of uncertainty and promote a professionally prepared persona. More importantly, we can never be in the room with our loved ones when we want to support them the most, but we can send them in with reinforcements. Let’s see, the simplest stocking stuffer is travel size hand sanitizer – large events often involve shaking over 50 people’s hands and are frequently followed by colds. Even for small events it is a proven secret weapon for tackling the combination of finger food and hand shaking at networking events. Next up, after a recruiter once had to run 10 minutes to get an adapter from a campus bookstore – I vowed no more tech surprises. The way to minimize tech setup uncertainty is to carry an extra adaptor, distinctive thumb drive so it doesn’t get mixed up with other speaker’s thumb drives, your personal laser pointer so the buttons are always in the same place, and of course a power bank. Rising above the logistics, to encourage learning in communications, consider Ted Talks, a joyful combination of entertainment and actionable insights. Now for the fashionable parts to customize for your special someone. Dresses cause no small amount of anxiety for the microphone techs – the solution is ridiculously simple – waist belts. Keeping it fashionably utilitarian, an easy to read big face analog watch allows one to focus on listening to people during hallway one on one conversations, but politely stay cognizant of time without checking a phone. My favorite for the je ne sais quoi touch of professionalism is a personalized engraved business card holder. Lastly to bring everything together, this is a special kit and as such, an inspirational travel pouch to help stay organized seems to be the right cherry on top. If I ran the sentiment analysis for articles talking about women in tech, I’m willing to bet it would come back pretty bleak. At times, being a woman in tech can really feel like a dark pit of wtf. But that’s not the full story. This week to combat those wtf blues, I wrote a happy list, my #HappyWiT list. A list of the little things about being a woman in tech that bring out the sunshine and make me smile. Some are near trivial, some you couldn’t buy if you wanted to. I never have to wait for the toilet. Seriously, never. On top of that the little zen touches and music make it feel like an escape. You can imagine doing yoga in there, because well, I have. Let me conclude, it was very relaxing. Women in tech make more money than florists. I love flowers, but if I was a florist, the options for my next holiday would not be between an island in Croatia and a Swiss Alps mountain. Oh right, and don’t forget financial stability for the next generation is included too. People remember me. With my stilettos and midi skirts, I stick out. The shock of seeing me makes people pause just long enough for me to be heard. I’ll take it, being louder than the noise is hard! I’m happy to be better known for data science than shoes now, but I know people started listening because of the suede pumps. One-time strangers help me. I’m where I’m at because of so many friendly hands helping me out along the way. I couldn’t ask for the kindness people have shown. It makes be believe an ounce of love is worth more than a pound of wtf. I get to help women who didn’t go into tech, which is quite a few people. In a few places in my career I’ve met shy parameters and products here and there that were overlooked. Then, with a little attention they blossom and unlock jobs, experiences, or opportunities for women around the world and their families! Speed, Cars, and Pedestrians – What is a natural mixture? Recently, SFMTA posted an interesting and pertinent infographic for drivers and bicyclists in San Francisco. Obviously, the faster a car is going when it hits someone the more bad news bears the result. But I couldn’t help but take a second look. Why is it seemingly right at 20mph that our fatality rates start to spike upwards? These stats are rounded to fit within the ‘whole person’ or to the nearest 10% mark. See sources for more precise numbers, which ballpark risk of death at 20 mph nearer to 5%. The human body is a remarkable feat of evolution. We live in an unpredictable environment from tree branches falling to kids jumping on us. Our bodies have been designed to withstand the impacts associated with our environment. Now, I can’t simulate what impacts cavemen encountered from chasing mammoths, but there is one basic impact everyone will most likely sustain at least once in their life. We all fall over. When children or happy drunk people on Mission are involved, treat 20mph as the maximal speed limit. Impact speed and a pedestrian’s risk of severe injury or death. This post was written before the tragic event of a high speed truck killing pedestrians in Nice. My heart goes out to those who lost loved ones, those who are still fighting to breathe, and those who have seen what can not be unseen. To donate and offer support for a full recovery, please visit here. I will leave this post up in the hope, data will help make the world a safe place. No specific technical skills are required (we’ll help you learn SQL, Python, and R). You should be extremely intelligent, have quantitative background, and be able to learn quickly and work independently. This is the perfect job for someone who’s really smart, driven, and extremely skilled at creatively solving problems. You’ll learn statistics, data mining, programming, and product design, but you’ve gotta start with what we can’t teach – intellectual sharpness and creativity. Let’s do some arithmetic. If each bullet is a one semester course, an apt pupil could think of applying in 2.5 years. That assumes you can fit machine learning into one course. With job descriptions changing on a monthly basis and skills requiring years of development, becoming a data scientist is a moving target. [Boss] Good job on project X! How did you do it? [Boss] You’re talented! We want more projects like X in the future. I’ll add those skills to the next job description. The question missing from the conversation is, ‘what skills did the data scientist have before they started work on Project X?’ I’m willing to bet a number of successful data science projects are done by practitioners who more closely match the first description than the second. So how do aspiring data scientists hit this moving target? Understand the motivations behind where the target is! The goals of the positions, while 7 years apart and written by different people, are strikingly similar. That’s the goal – advance the mission. Now, this is done in slowly and systematically by talented people with many skills. But every so often, I feel inspired when someone with “intellectual sharpness and creativity” challenges the imagination. Above are opinions, for facts on how data science is changing please see Evolution of Data Science. There is a professional meta moment that occurs once in a blue moon. It happens when a doctor cures her own cold, when an electrician replaces his circuit breaker, and when a data scientist studies the evolution of data science. With the profiles of 125,000 data professionals on LinkedIn, we can track how data science is changing! Oddly enough, the stories of where they come from and where they are going are diverging! Let’s take a look. Famously, data science is an increasingly popular field with exponential growth in the past few years. However, degrees in data science are only now graduating students. So where did all the current 125k data practitioners come from? If you break down the distribution of degrees obtained by data professionals, computer science is the leader. However, the big take away is that the top 10 degrees account for only a quarter of all degrees held by data professionals! Top 10 degrees earned by data professionals. It’s a bumpy trajectory, but over time, the trend is higher. In other words, where data professionals come from is becoming more homogenous. With the increase in data science masters programs and incubators, I expect this trend to continue. Growth is not evenly experienced by each degree and we can look at changes within the top 10 backgrounds. Some are steadily gaining and some are rapidly loosing prominence. For those in Silicon Valley, this probably matches your on the ground experience. Originally, people already at companies stepped into data science roles on an as needed basis. Computer scientists and marketers were in common supply. Now that companies are hiring directly into data science, roles economists and statisticians are on the rise. The top 10 industries have more than a quarter of data professionals, but still not a majority. Over time, the top 10 are clearly loosing dominance. Top 10 industries for data professionals. Side by side, these trends seem at odds, with a potential down side. Consider a newly minted data scientist with a computer science background hired into an art conservation company. It’s possible their first year in the industry is spent using big data to confirm what conservationists already know from centuries of domain expertise. It would be a shame for such talent and resources to be spent re-inventing the wheel. A possible solution can be borrowed from Applied Math. My recommendation to the next generation of data scientists is learn your craft, learn your stats, learn your map-reduce, learn your visualizations. But for fun, couple your studies with classical courses from an application field you are interested in. 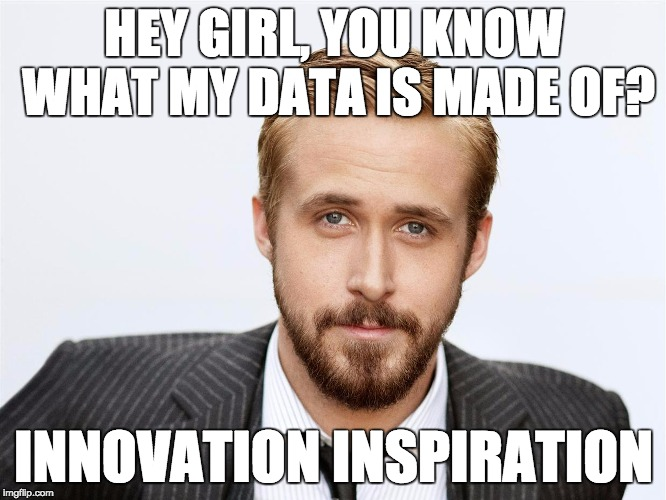 After all, some of the happiest data scientists I know, use their skills to advance their passions in housing, movies, and fashion. I love answering popular science questions! Recently, I was able to answer three of the juiciest career related questions I could think of with LinkedIn’s data. To put the cherry on top, LinkedIn and Strata were a tremendous help and made the work public here and here. Now, let me tell you the first of three data stories. It’s about the growth of women’s presence in executive leadership and how well liked executive leaders are. C-Suites, or the group of chief executive officers (CEO), chief technical (CTO), COO, CIO, … are a powerful and fascinating crowd. While many stories of CEOs are about people who grew with the company from early stages, that is not typical. The C-Suite is not a group of people you pull off the shelf at the beginning stage of the company and who stay the same as the company grows. 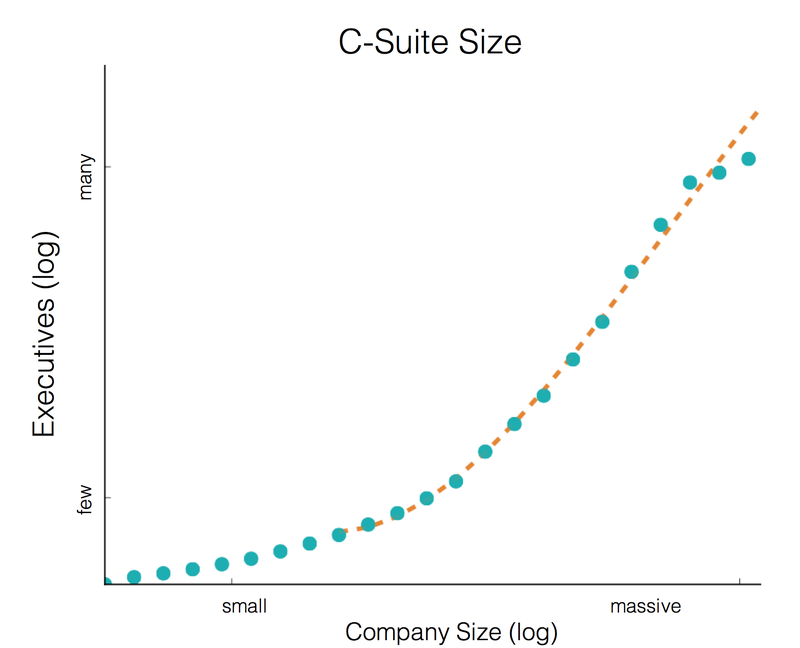 In fact, C-Suite growth is a function of company growth. There are two periods of growth, early stage and sustained growth. In the early growth stage, a company will have a CEO and may gain additional CXOs (people with chief department X officer titles), but is mostly focused on growing the employee base. Right around 3k employees the sustaining growth phase kicks in. For every additional 1k employees a company gains, the C-Suite will grow by an additional CXO. How the C-Suite grows has two interesting elements. 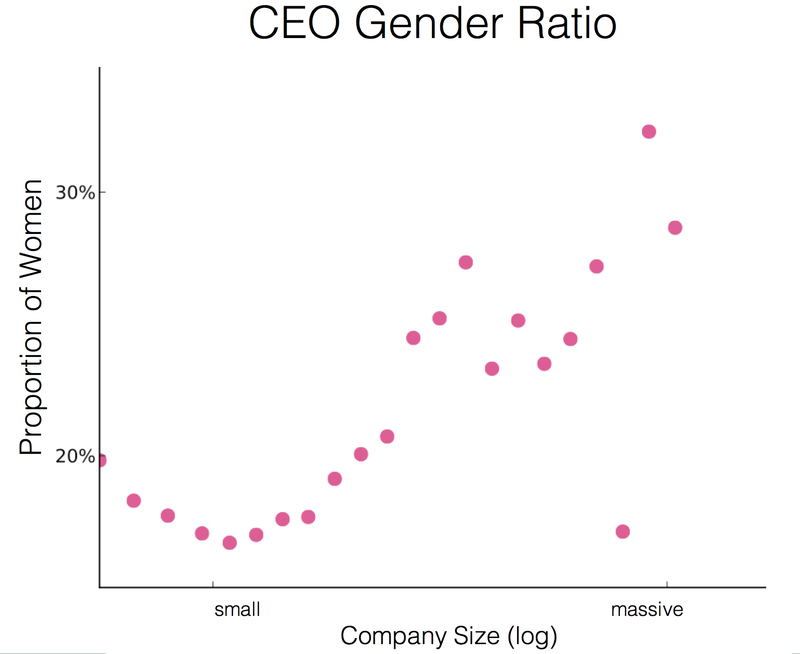 For starters, large C-Suites actually have two CEOs, two CTOs, etc. This organization comes from mergers, acquisitions, and managing global companies. The second CEO’s title will be along the lines of CEO of Consumer Products, CEO of Asian Ventures, etc. 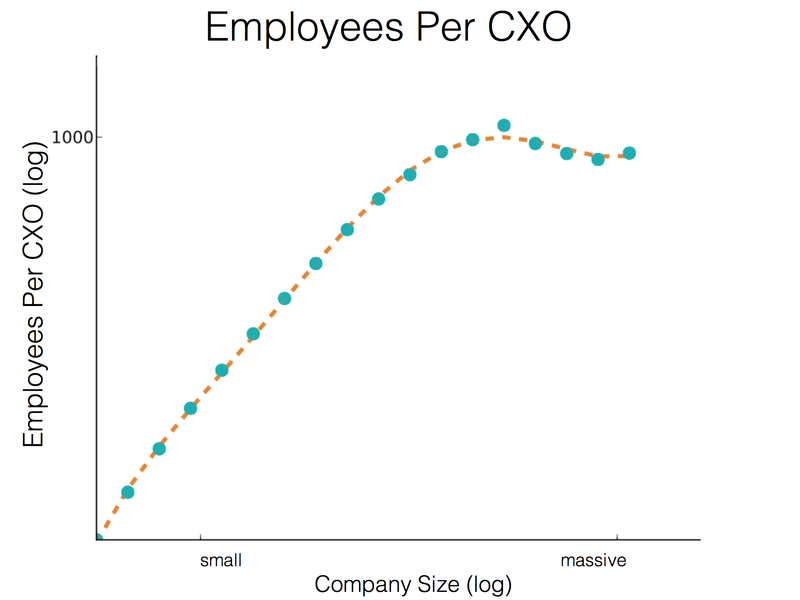 The other cause of growth in the C-Suite is the X in CXO adopts many new meanings. Massive companies will most likely have a chief medical officer, chief learning officer, chief HR officer, etc. The diversity of titles of the C-Suite explodes for large companies. A question arises, as the diversity of C-Suite titles increases, how does the diversity of the C-Suite change? Note: the outliers are from buckets of company size containing armed security organizations. If you are a woman aspiring to the C-Suite, dream big. Dream massive. Right. Let’s say you get to the C-Suite. There is a famous study on a side effect by the Harvard Business School known as the Heidi/Howard paradigm. Women in managerial roles are perceived as equally competent and knowledgeable as men in similar roles, but not as well liked. Appeal can be tough to measure. To approximate how well liked a person is, let us use the number of endorsements they receive on LinkedIn. It’s not a precise measure of how well liked they are, but is close enough to give us insights into large trends. It’s inline with expectations after the Heidi/Howard study. Men receive more endorsements in general. However, that’s not the complete picture. For small companies, women in the C-Suite receive more endorsements. 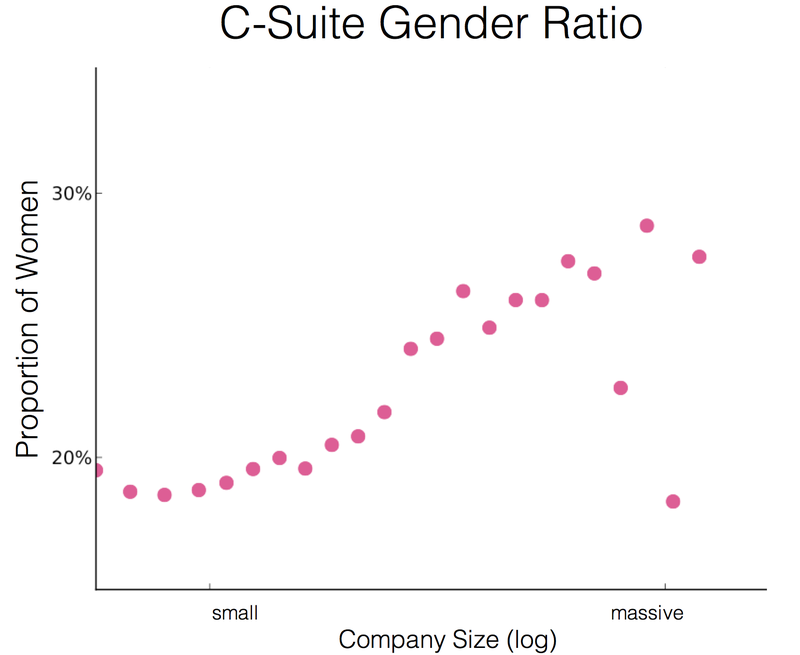 In fact, women in the C-Suite at small companies receive the most endorsements. The implications are twofold. Heidi/Howard is not the complete picture. 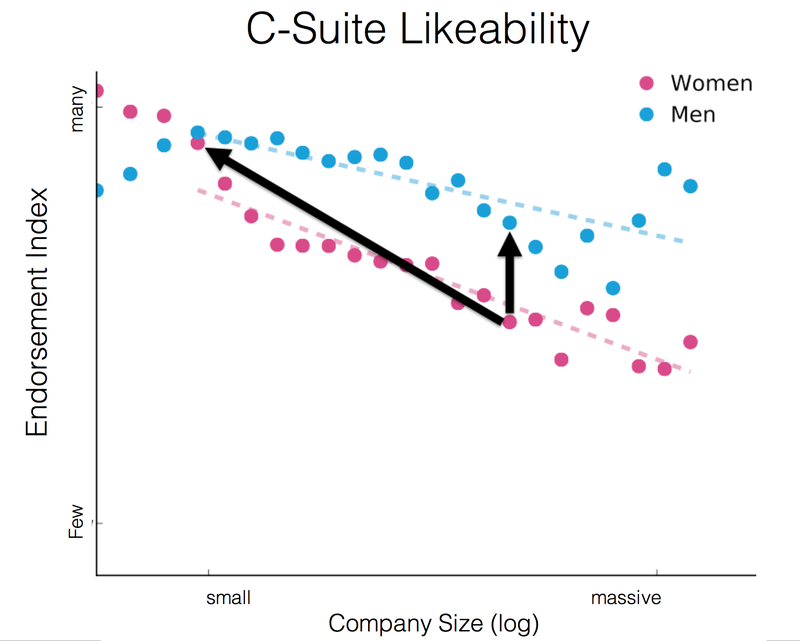 If the goal is to increase likeability, the benchmark should not be set between men and women, but between leaders at small and large companies. My goal is to add a positive perspective for what is possible. I hope some of this work is inspiring for both men and women. I do not hypothesize on the right and wrong compositions of a C-Suite; I think that is an intensely personal question for each and every company. As a somewhat ambitious woman at the very start of my career – these numbers make me smile.